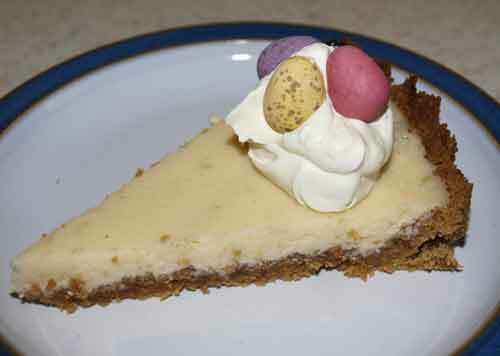 Farmersgirl Kitchen: Delia's Key Lime Pie with an Easter twist! I was looking through some cookbooks for a dessert suitable for Easter weekend, something that would be big enough to last for two to three days. I chose this Key Lime Pie from Delia Smith's How to Cook Book Two. It was quick and easy to make and tasted great. It also turned out pretty much as illustrated in Delia's book. She decorated hers with a twist of lime, I decorated mine with some Cadbury's mini eggs! You will need a loose-based flan tin with a diameter of 9 inches (23cm), 1 inch (2.5cm) deep, and a solid baking sheet. Begin by placing the butter in a pan over the lowest heat to melt, then crusth the digestive biscuits. The esiest way to do this is to lay them out flat in a polythene bag and crush them with a rolling pin, rolling over using a lot of pressure. Now empty the contents of the bag into a bowl and mix in the Grape-Nuts, then add the melted butter-crumb mixture in the flan tin and, using your hands, press it down evenly and firmly all over the base and up the sides of the tin. Then place it on the baking sheet and bake on the centre shelf of the oven for 10-12 minutes, or until crisp and golden brown. While that's happening, place the egg yolks and lime zest in a bowl and, using an electric hand mixer, whisk them for about 2 minutes, or until the egg has thickened, then add the condensed milk and whisk for another 4 minutes. Finally , add the lime juice and give it another quick whisk, then pour the whole lot on to the baked crust and return it to the oven for another 20 minutes, or until it feels just set when you lightly press the centre with your little finger. Now remove it from the oven and when it's completely cold, cover it with clingfilm and chill until needed. Seve cut in slices with creme fraiche and twist of lime for decoration. oh wow love this America and the UK in a pie! Looks delicious! I absolutely ADORE Key Lime Pie, though I've never made Delia's version. I think I might have to try it! I've always wanted to make Key Lime Pie but for some reason I've just never gotten around to it. Really must give it a try as yours is making my mouth water!